Recently, I’ve been playing quite a bit of Krosmaster Arena, and they’ve been running a map contest on one of their community sites. I decided to try my hand at a map for the game, with a unique mechanic that plays with the shop/item systems the game has, which are one of my favorite parts of the game. For my map, I wanted to make a somewhat simple mechanic that changed the flow of the map somewhat significantly, but moreso than that, I wanted a map where each set of map edges made for a significantly different tempo and game. A fight has broken out around the cottage of a master jeweler. Some say that hidden in his modest home are massive coins, of great value to the demons of hours and minutes. They would certainly reward you greatly for them, as long as you can get ahold of them first! So, before getting into the special rules for the map, let’s look at the map itself. The North and South sides, when played from, make a game with more money (but still relatively less than the original maps,) more and earlier shopping opportunities, and significantly more “walls” which block LOS. In ccomparison the East/West matchup has longer sight lines between camps, less early money, and the ability to have two units on crates at the end of turn one! The unobstructed sight lines between the lines of crates make for tense and lethal exchanges between ranged-specialist characters, while the map being separated into vertical “lanes” makes it difficult for melee characters to gain an edge, and makes it tough for ranged teams who’re content in holding their crates to collect and spend money. In the playtests we had, while it wasn’t impossible for a mostly melee warband to win, it definitely put them off on the wrong foot. Now, for the special rules! The big kama is a special coin that spawns in the center of the map, and can only be redeemed at your spawn row’s shop. In a default tournament kit where the players do not wish to use a more thematically appropriate token (such as the large metal kama or simply a coin from their pockets,) use half of one of the unused bushes to represent the big kama. Heavy: This character can’t be moved by spells. Hands Full: This character has 0AP. When a character with the big kama reaches their team’s spawn shop (these are the yellow squares on the edges of the board,) the coin is automatically redeemed! The player who just turned in the coin then takes up to four free shop actions, spending up to 12 kamas (so they could one gold reward, two jade, four granite, or any combination costing up two 12 kamas.) After taking their shop actions, the player to their left places the big kama in one of the four center yellow spaces again. If the character holding the big kama is defeated, he drops the coin! the player who defeated them places the coin on a space adjacent to the character who was defeated before they are removed from the board. Initially, the coin began the game in play. But, since there are four spaces where the coin can go, it created a slightly unfair advantage for whoever the coin was closest to. Then, I playtested a few games where the coin spawned on the first tension roll, but sometimes you just plain don’t get a tension roll in a game, and I wanted to make sure it spawned pretty much every game. 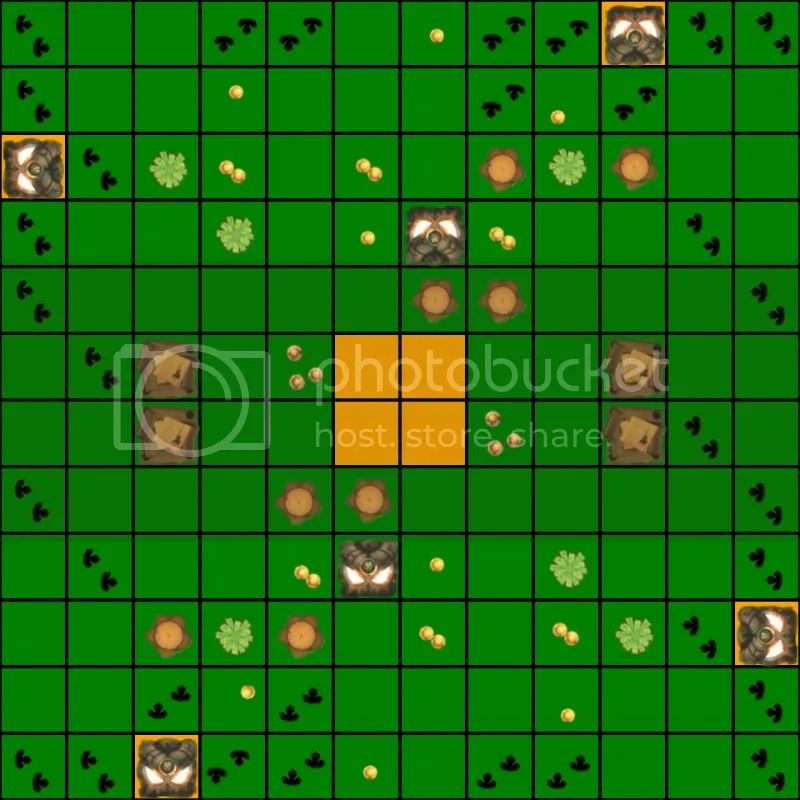 Also changed from the initial version was the trees around the yellow squares. The initial idea was that they weren’t even trees, but just abstracted blocking terrain to symbolize the building the coin was in, and as such, there was more terrain in general around the center. This didn’t really enhance gameplay, and made it somewhat easy to get the coin, as long as your opponent hadn’t blocked off both sides of the hut with you in it. How it’s built now, players are taking a serious risk spending a turn or two getting the coin if there’s an opposing character threatening the center from the crates. Lastly, when characters died, they used to drop the coin right where they died. I changed the mechanic to have them drop it next to them, to make it more reasonable for players trying to steal the coin away from the team that has it. Obviously, redeeming the coin is a powerful perk. However, being able to pressure your opponent while they are essentially down a character while turning in the coin can be equally powerful. I did have a game where Nox slipped past the enemy lines to sit on the enemy’s coin shop and prevent the opposing coin-carrier from turning it in; a revised-for-production version of this map might have two of those shops on each spawn line, but I’d like to playtest that some before making that change, as I feel the sparse shops help make the game more interesting and tense, as diverting a character away from the action to buy can be a very serious choice.